Not far from Dana, the Takalar is having engine trouble. Among the passengers on board fleeing from persecution are Roya and her mother, and Roya’s unborn sister. The storm now closing in on the Takalar and the Java Ridge will mean catastrophe for them all. Jock Serong’s books don’t shy away from tackling topics that affect contemporary society and in On the Java Ridge, although this doesn’t dominate the narrative, they are there. In Quota, it was the ethics of the legal system; in The Rules of Backyard Cricket it was the corruption of professional sport – and in this third novel, it’s the growing tendency of governments to outsource their responsibilities to private companies, preventing any real oversight by the media or the public. It’s the near future and the nation is a week out from a divisive election when the Border Integrity Minister announces the government will outsource the protection of northern waters to ‘our private sector partners, Core Resolve’. No longer will the Navy board or rescue vessels that make it into Australian waters; that’s for Core Resolve to deal with. Up north, not far from Ashmore Reef, an Australian boat on a surfing tour of the Indonesian archipelago pulls into a sheltered lagoon before the onset of a terrible storm. During the night and through the storm, skipper Isi Natoli hears distant cries for help, as a boatload of asylum seekers flounders on the reef encircling the lagoon. In the morning, the lagoon is full of their bodies and the tourists set about trying to rescue the few survivors. The fate of both the survivors and their saviours is now inextricably linked to the games being played out in Canberra; as far as the world is concerned, the disaster and all those affected ‘disappear’. 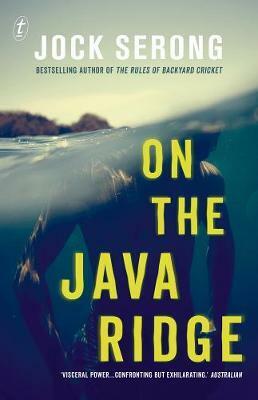 Make no mistake, On the Java Ridge is no polemic; the reader is taken on a journey that will leave them exhilarated, angry and compulsively engaged. It marks Serong as one of the great exponents of tense, totally engaging narrative fiction, combining strong plots with complex and interesting characters whose predicaments we can all identify with.